I stood eye to eye with E. Nourse recently at her current exhibition “Rites of Passage” at the Cincinnati Art Museum. The painting: her own lifesized self-portrait. Not given to idealization even when concerned with her own features, she portrays herself actively at work with a clear and unblinking eye. 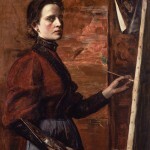 A strong light carves her features and illuminates the brush in hand as she confronts another canvas in her studio. The tacked canvas edge intersects at the corner with her array of brushes, realized as a series of dashed out strokes. She strove to compete at every opportunity on both sides of the cultural ocean and was one of few women artists in her time to achieve international recognition. She was given to signing her name E. Nourse to avoid the gender bias of the exhibition jurors. 1910 “Les volet close” (Closed Blind) purchased for the French National Collection at the Musee du Luxembourg. At a time when commercial industrialism was visiting poverty, immorality and social travesties upon the working classes, the philosophies of John Ruskin sounded a call for the return to nature and simpler values. Nourse, a devout Catholic, strove to create works of art resonating with simple spiritual values. The accolades she won during her lifetime are a tribute to her artistry, yes, but they also reflect her ability to satisfy a desire for spiritual sustenance in the conflicted secular world. Spirituality can be shown to be a prominent theme in her work throughout her lifetime. In her many portrayals of motherhood, she expressed the ideal in the daily maternal acts of nurturing, tending and teaching. The large work “Le Mere” 1888, signed darkly E. Nourse, is the tender rendering of reverence and maternal attention in the solitude of nap time, inches away from the crib. I couldn’t help but notice the expression of character in the young mother’s hands, placed around the bulk of the child as it lay on her lap. This painting was noted at the Salon in Paris and hung “on the line” or at eye level, a designation of special merit for this modern madonna. The work “Premier Communion” 1895, and its multiple studies dominate the exhibit. Nourse’s process of conceptualization can be seen maturing through the selection of multiple drafts from sketchbook on display to small studies and portrait panels. The shapes of the painting evolve, a simplification of form gels as her vision intensifies. The entire composition is blocked out in a 9×12″ panel. Comparing this study to the final work will reward you with the refinements that make Premier Communion the statement it was intended to be. The cupcake cones of the young girls patiently enduring the primping attention of the attending nun are a painting marvel. The masterful shaping of the white forms, achieving the gauze-like veils with beautiful glazing, is set off by the bright spank of silk be-ribboned accents on each head and waist. Each girl, both transformed and shielded from the secular world in their array, solemnly clutches a rosary or gold tipped prayer book in gloved hands. 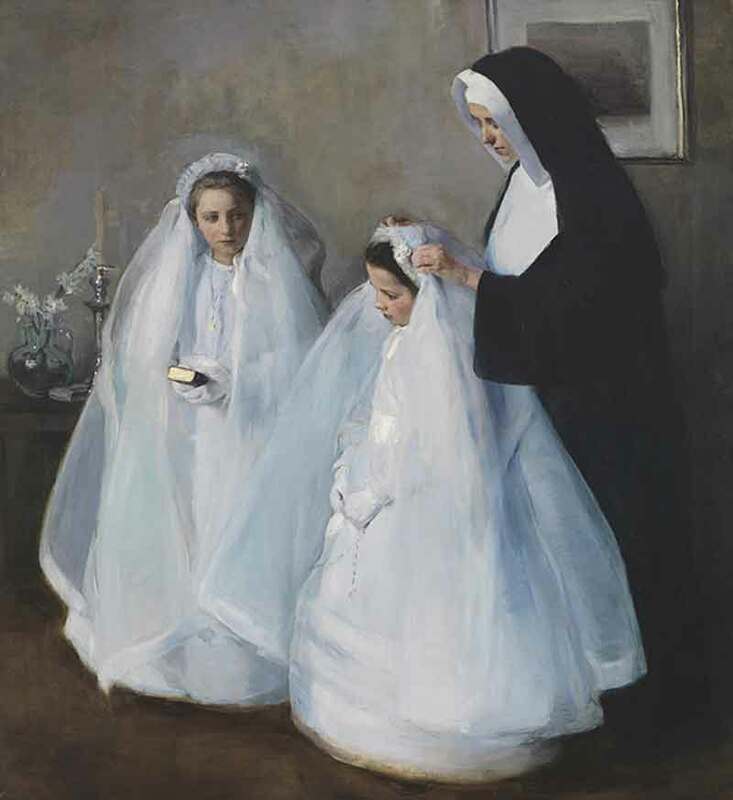 At the time of this painting, communicants received the sacrament at 12 or 13 years of age, thus entering adulthood. 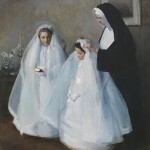 Intended symbolically to be a prefiguration of the sacrament of marriage, the event was complete with lavish clothing, gifts and intensive preparation. 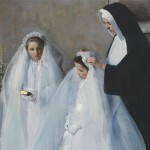 Not until modern times was the age lowered to age 7 by Pope Pius X who decreed that the first Communion of children should not be deferred too long after they had reached the age of discretion. Study the Reading lesson. The yellow light from the garden window creates a back glow to the heads of two female reading children. 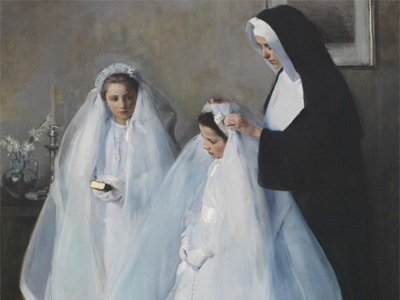 The attending religious wears a traditional winged headdress that obscures her identity but allows us to observe her lips moving in close proximity to the ear of the girl in the front of the painting. Nourse succeeds in infusing this simple event with a sacred secret, which you, the casual interloper, may almost share as you pause. Nourse signs her full name to the painting in a scarlet red script. I cannot conclude without recording my impressions about her draughtmanship for Nourse is above all a consummate and consistent draughtsman. Being almost entirely American trained, she filled sketch books throughout her career with studies of figures, clothed, unclothed, landscapes and painting notes. (Another sketchbook may be seen at the Mercantile Library.) Consider the Emerson Pitman portraits in this show. Executed while she stayed with her sister Adelaide Pitman in Cincinnati, Nourse sensitively renders her child nephew as he sleeps. Both drawings rest on a tan sheet and one is tinted in delicate shades of pastel, a medium resurging in popularity at the time. The frames of several works in the show are intricately worked with boughs of laurels and naturally observed leaf patterns. In walking toward the Nourse exhibit, one must pass through a room displaying intricately carved furniture and two carved arches in black walnut and cherry by the Fry and Pitman family craftsmen of Cincinnati. These artifacts reflect a return to the spirituality and beauty of nature through the handcraft of the artisan. The philosophy of John Ruskin rested on a return to nature, demanding of the artist not a lazy report of repetitious shapes but the development of an acute observation of flora and fauna, sensitive to the living line. Both Elizabeth and sister Adelaide took up the craftsmanship of woodcarving, Elizabeth adding painted bird and floral panels to the completed pieces. In 1921, Nourse received the Laetare Medal from Notre Dame University, South Bend, Indiana, a public honor that evoked much publicity on both sides of the ocean. 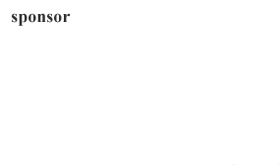 Annually given to a Catholic layperson, this honor was awarded for distinguished personal service to humanity. Over her fifty-five year professional career, Nourse’s work expressed deep spiritual values that elevated the ordinary woman and the worker in their daily lives. 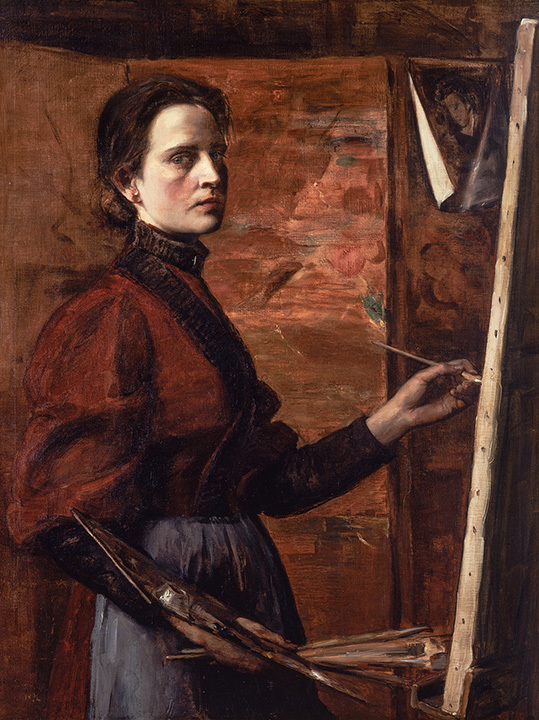 Experiencing this exhibition and its adjoining rooms was immensely inspirational and merely a glimpse into the accomplishments of the painter, Elizabeth Nourse. Marlene Steele paints and teaches in Cincinnati Ohio.